The number of Grizzly Bears roaming in and around Yellowstone National Park has hit its highest peak in decades. According to a report by USA Today, a research team recently announced at least 603 bears have been spotted, more than three times the number when the species was put on the endangered list in 1975. At that time, hunting was outlawed in the Yellowstone area of Wyoming, Montana and Idaho. Unfortunately, the increase in the number of bears also means there is more of a chance humans will come in contact with grizzly bears. As natural food supplies such as spawning cutthroat trout and whitebark pine nuts become scarce, more humans have been reporting grizzly bear encounters. 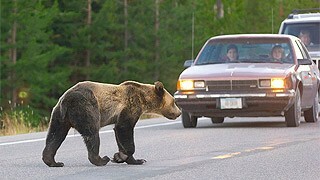 According to research done by the Interagency Grizzly Bear Study Team, there were 148 bear-human conflicts in 2009. Only six of these encounters actually resulted in human injury-most interactions were attacks on livestock or attempts to obtain food from humans. "The frequency of grizzly bear-human conflicts is inversely associated with the abundance of natural bear foods," reads the report. "When the abundance of native bear foods is below average, incidents of grizzly bears damaging property and obtaining human foods and garbage increase, especially during late summer and falls when bears are hyperphagic." However, some of the attacks have been serious. Just this year, two people were killed by bear attacks in the Yellowstone region. Last week, a hunter in Wyoming shot and killed a grizzly bear in self-defense. He suffered lacerations from a bit to the leg from the bear-injuries that are not considered life threatening. The death of this bear marked the 46th bear reported killed or removed from the wild this year. Wildlife officials estimated the real number is actually higher because of unreported killings. Despite the drop in numbers, scientist Churck Schwartz from the U.S. Geological Survey told USA Today: "Our population is strong, our counts of females are high." Schwartz, who heads the Interagency Grizzly Bear Study Team, said the 603 population figure was a conservative estimate that could actually be significantly higher. The state of Wyoming is pushing to reduce the current bear count down to 500. The U.S. Fish and Wildlife Service took Yellow-stone area bears off the endangered species list in 2007, but a federal judge put them back on the list last year. At the time grizzlies were taken off the list, Bill Rudd from the Wyoming Game and Fish Department told the Jackson Hole News and Guide: "We're sort of at the number of bears in Wyoming that we want." "We wouldn't be delisting these bears if we didn't have confidence that they were going to be well taken care of now and into the future. Grizzly bears are hard to recover. It's a big deal to do this. We spend a lot of time making sure all of the details are covered here." Photo by xoque on flickr.